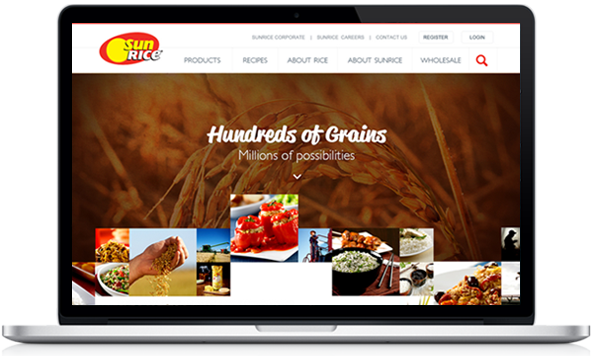 SunRice is a major Australian food exporter and one of the world’s largest rice food companies. Holistic corporate and consumer digital strategy and website. Fluid, touch-friendly design. Tablet-optimised recipe engine. ERP integration. The SunRice TV commercials in the ‘80s are legendary. Those commercials where different objects and landmarks were sculptured from rice. Like Corn and Fries, or the Opera House. Twenty years later, many of us can still vividly recall the voice in the ads, the rice sculptures and of course, the name behind it all, SunRice. SunRice is a major Australian agricultural business, supporting hundreds of rice and grain growers. SunRice is a major global exporter to countries quite literally, all around the world. SunRice is a major food company producing everything from bags of Arborio rice and rice crackers, to readymade meals. They even own a business that sells olives and capers. 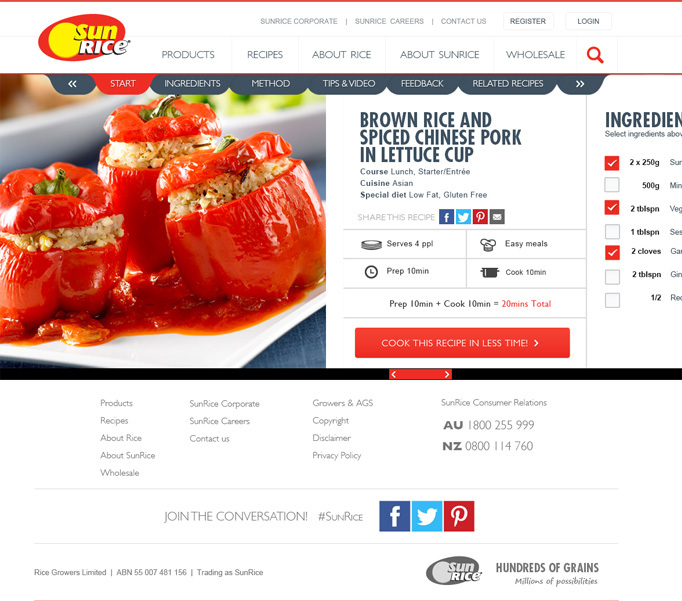 The new SunRice website was designed to showcase this amazing Australian story; to launch the new SunRice brand; to let consumers learn more about some of their favourite food products and ingredients; and of course, to offer plenty of great rice recipes. The website also supports the growers and the business more generally which is no nigh feat when you consider the breadth of their operations. As SunRice puts it: 2100 employees. 60 countries. 30 brands. Nine businesses. Together, we’re SunRice. And now they have a website to help pull it all together.